Walgreens has many shopping rewards programs available and Register Rewards are one of the most confusing. Let’s talk a little about how to use Register Rewards at Walgreens so that you can make your savings as smooth as possible. 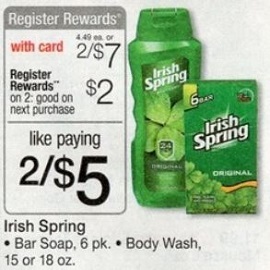 This means that you’ll buy two Irish Spring Bar Soap 6 pks or Body Wash 15 or 18 oz for $7 and get $2 Register Rewards (also known as “RR”) in return. You can also use coupons during this purchase to get even more savings! Check the Coupon Database for any coupons that you may be looking for. In a situation like this, your Colgate Toothpaste is priced at $3. You would use the $.50 coupon available in the upcoming newspaper (per the ad) to pay $2.50 out of pocket and get $2.50 RR back. That’s like getting some for free! First, Register Rewards are manufacturer’s coupons. There is a limit of one manufacturer’s coupon per item, so you cannot redeem a Register Reward if you have a coupon for every item in your order. This is the perfect opportunity for you to purchase an item that requires no coupon upfront, but where you’ll get money back through Ibotta, SavingStar or Checkout 51 after your purchase. If that isn’t something you’re interested in doing, you can also use a filler item. A filler is anything that you purchase specifically so that you can use that Register Reward. Great filler items include caramels by the checkout (usually $.39), pencils, anything on clearance for $.50 or less or cheap candy. The second thing that you need to know about redeeming Register Rewards is that you cannot use a RR from a brand (i.e. Colgate) to buy another item from the same brand (i.e. Colgate). What you CAN do is use them to buy a different brand. You are able to get a RR from Colgate and then use it to buy a Crest item. Let me be clear, you actually ARE able to use the RR to purchase anything you want, but if you attempt to use it on the same brand (i.e. 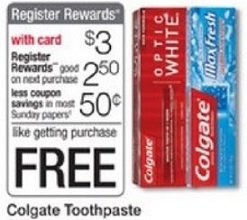 buying more Colgate), the new Register Reward that you are expecting will not print. Don’t do it! Hopefully this has answered most of your questions about how to use Register Rewards at Walgreens and your next shop there will be a great one! 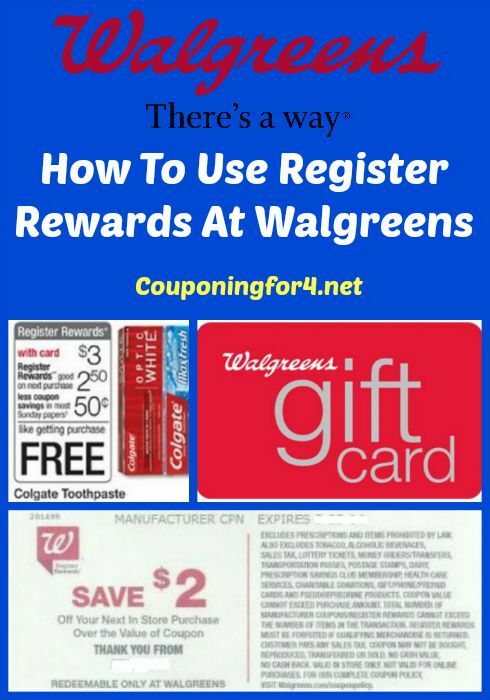 Find Walgreens deals here, coupon lingo here and how to shop at Walgreens here. Ready for more? Check out a list of other Couponing Tips here! Actually, I bought a coke deal and received RR from that transaction. Then I proceeded to buy a Caress Soap deal that was suppose to also spit out RR, BUT they told me since I used my RR to purchase the Caress I would not be receiving them on the Caress. I called a manager over and she confirmed it! I haven’t shopped Walgreens since! K, unless they are both owned by same company or in the same RR deal, you should’ve received the 2nd RR. Sorry you had that bad experience. The change in Walgreens coupons, RR and now Balance Rewards has shied many away from shopping there in the last couple of years. I went to Walgreens and used a colgate RR on a crest deal and the cashier had to force the RR. The cashier proceeded to tell me that I can use a colgate RR on a colgate RR and still receive a RR back if the deal calls for it. I asked her when it changed. I should of tried it with her and if it didn’t work then she would have to void it and do it like I had been doing it. I know the Cool Blast gum deal you could roll the RR but I normally don’t because you usually don’t get the RR back. So I don’t know if the registers are changing or what but I love shopping at Walgreens.